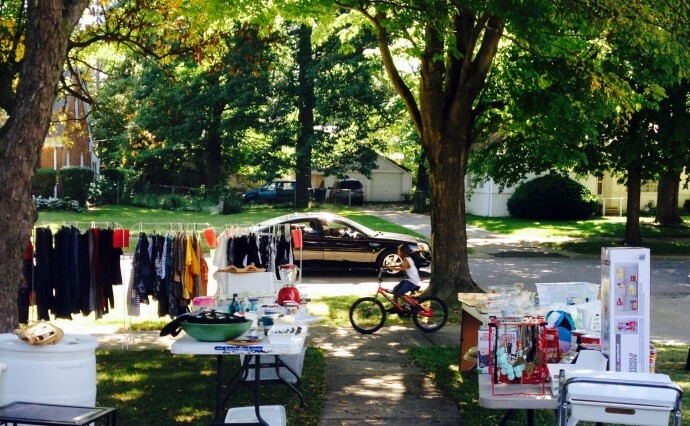 On Saturday, June 25th, Rosedale Park Improvement Association hosted its annual neighborhood-wide garage sale. The event covers 60 city blocks between Grand River and Lyndon, Evergreen and Ashton, with many residents from the nearby Grandmont #1 neighborhood also participating. Dozens of neighbors join in each year, offering up their household wares and gently used items to hundreds of bargain hunters, arriving from all across Metro Detroit. Indeed, the Rosedale Park Garage Sale is as much about building community as it is about “spring cleaning.” Neighbors can often be found jointly hosting their sales, hoping their collaborations will attract more customers by offering a larger supply of goods. Other neighbors can be seen on bikes or walking dogs, in groups and carpools, all with the same goal—to find those treasures and to have a good time searching for them! A quick tour through the neighborhood revealed a wide-range of items available including bikes, furniture, household items, art work, collectables, clothes and even a lemonade stand or two. Perhaps the most exciting find of the day? A set of arm chairs sold to a very excited neighbor named Tamara, who couldn’t help herself from dancing to celebrate the find. If you missed this year’s event, you can always catch it next year (so set your calendar reminders now). The neighborhood-wide sale is held each year on the fourth Saturday in June between 9 am to 3 pm, rain or shine. Plan to get there early, though, as residents reported that more than half of the day’s shoppers arrive within the first hour.